As a foreigner, if you have a permesso di soggiorno (a permit to stay) you are entitled to enroll in the Italian public health system and receive state-sponsored medical services, including free or low cost prescriptions and access to the public medical system at a low cost. Tourists are also able to register for the public system, but the cost is much higher than average medical travel insurance to enrollment in the public health system is only worth it for long-term stay. To qualify for these medical services you must register for and obtain a Tessera Sanitaria (health card). 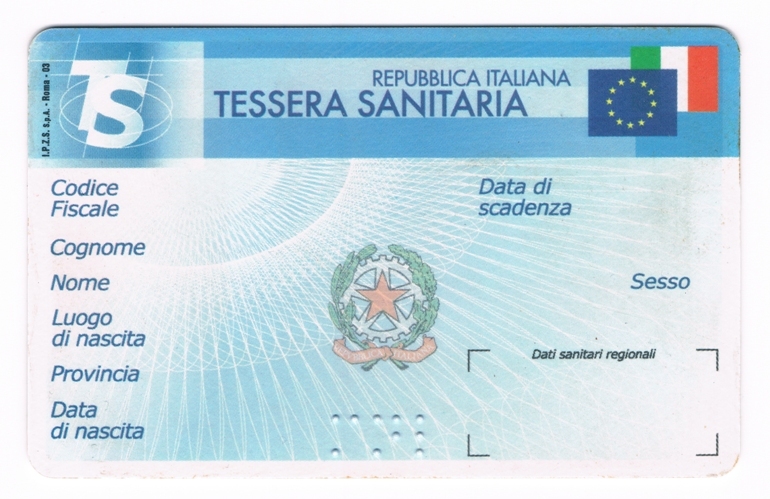 The Tessera Sanitaria includes a person’s name, personal information, and Codice Fiscale (fiscal code). The card can be used throughout Europe. However, the process to register for this health card requires several steps that are not always the most straightforward. Here is a simple, step-by-step tutorial on how to get your Tessera Sanitaria. Go and register for your Codice Fiscale (tax identification number). The number is a culmination of your name, birthdate, and place of birth and is used similarly to a social security number in Italy. You will need it for a variety of tax purposes, like opening a bank account in Italy or applying for your Tessera Sanitaria. To officially obtain your codice fiscale you must go to your provincial Agenzia delle Entrate (tax office) with your passport, fill-out the appropriate form, and register your information. It only a few minutes to do and is free. Look up your local Agenzia delle Entrate here . You will be printed a paper copy of your codice fiscal and the actual card will be mailed to your Italian place of residence. Go to your local ASL office, which is based on which neighborhood you live in (look up location here). At the ASL office, you must show your Permesso di Soggiorno (permit of stay) receipts, your passport, your Codice Fiscale (tax identification number), housing contract or certificate of residence, and INA-Assitalia payment receipts (for students only). At the ASL office you must register for your Dottore di Base (general practitioner doctor). Your doctor’s office must be in your neighborhood. You will be given a list of doctors to choose from. Once you have registered at the ASL office and selected your GP doctor, your Tessera Sanitaria will be mailed to your residence. In the interim period the ASL office will print you a paper version of the card. Once you have registered for your Tessera Sanitaria, you can go to your GP for check-ups and to schedule specialist visits and tests at the public hospital. You need to get a ricetta (red and white prescription form issued to you by your GP) to schedule any appointments at the hospital. All hospital appointments must be scheduled by calling your regional CUP (Centro Unificato Prenotazioni) hotline. For more information on registering for a Tessera Sanitaria you can check out The Curious Cat Expat or Angloinfo .